During the third quarter of this year, Facebook served up 297 billion display ads, representing 23.1% of the market and more than twice the share the company held at this time last year, according to data from comScore. At that pace, Facebook is now serving more than 1 trillion ads per year. Facebook also now has a huge lead over the next closest publisher in the display ad space, Yahoo, which, by comparison, garnered nearly 141 billion display ad impressions. Microsoft ranks third with 5% market share and Google sits at fifth place with 2.7%. In total, display advertising impressions for the quarter were up 22% year-over-year — a significant increase that represents a strong rebound for the display advertising space. On average, Internet users in the U.S. were each delivered more than 6,000 display ads during the quarter. comScore Senior Vice President Jeff Hacket attributes publishers’ abilities to serve up highly targeted ads as a primary contributing factor to the big bump. “The ability to buy specific audiences is enabling a greater number of display ads to be delivered on target, display formats are improving at a rapid rate, and the quality of creative is getting better every day. As publishers prove the value of online display ad campaigns, digital should continue to carve out a bigger piece of the advertising pie,” he said. 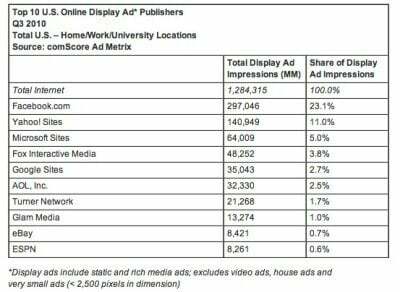 This theory seems to support Facebook’s dominant spot as top publisher for display ads. On the advertiser side of things, AT&T was most prolific, serving a total of 21.1 billion ad impressions. AT&T also ranks second in estimated display ad spending for the quarter. According to a previous IAB Internet Advertising revenue report, display advertising is second only to search when it comes to total online ad spend.